UPGRADE TO DELUXE: INCLUDES 4 PIECE ACCESSORY KIT: Berry, Pumpkin, Salsa Screens and Grape Spiral. Electric Motor Option (additional cost, not included with base model): Make your life easier with the Victorio Strainer & Sauce Maker. 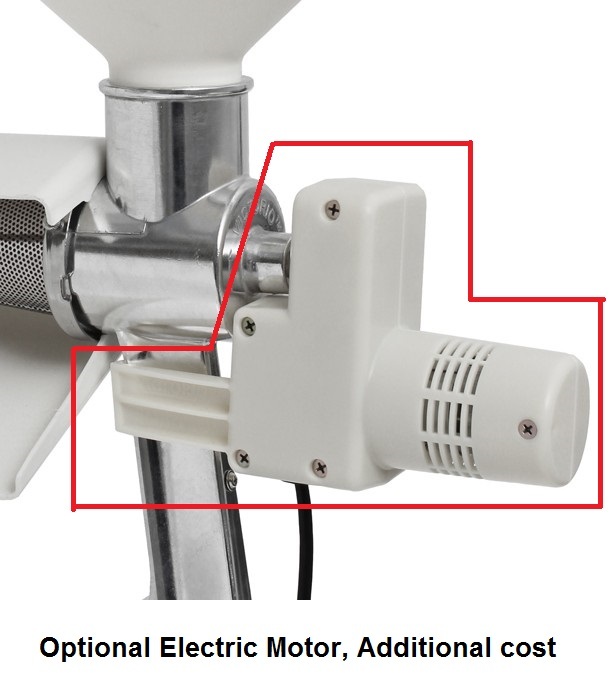 Easily convert your manual operated food strainer into a convenient electric powered food strainer. 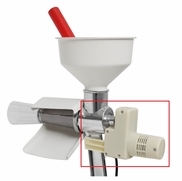 This electric motor is for the Victorio Food Strainer model 250 only. Re-designed and loaded with advanced features, the VKP250 Model 250 Victorio Strainer and Sauce Maker is your very own, portable and easy to use food strainer. Relish home-made sauces, pulpy juices, purees and yummy jams with this VKP250 Model 250 Victorio Strainer and Sauce Maker. It is easy to use and demands least maintenance. This handy food strainer and sauce maker will simplify all the time consuming recipes. 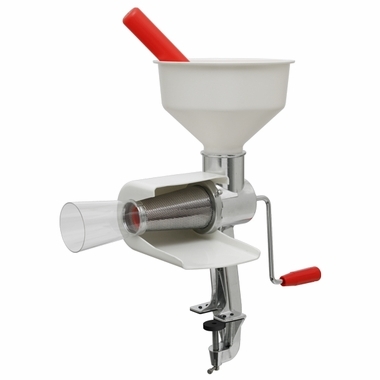 Simply add slices in the hopper of the Victorio food mill and start cranking. It will remove the core from their skin and seeds to offer you fresh and delectable juices of fruits or raw veggies of your choice. The best thing about this food strainer and sauce maker, is that it doesn't require any professional skills for installation and operations. You can read the instruction booklet and start using it for your day today meals. Our small harvests of grapes, currants and tomatoes are big enough to make pureeing and juicing a time consuming chore, but not big enough to justify dedicated equipment like grape presses. Our centrifugal electric juicer didn't handle pulp and seeds well beyond a glass of veggie or apple juice. So, I decided to try the Victorio Strainer for the concord grapes this fall. It was easy to assemble. I used the berry strainer with the grape spiral and made about 120 ozs of juice before the skins and seeds jammed up at the end of the spiral, and the cranking pressure became too strong for the seal, so the juice started squeezing out. The "waste" seemed to have quite a bit of pulp and liquid left in it, so I decided to put it through another round, this time with the tomato strainer. I was satisfied with the rather dry ejection this time and glad to have added a useful and well designed and manufactured utensil at a very reasonable cost. 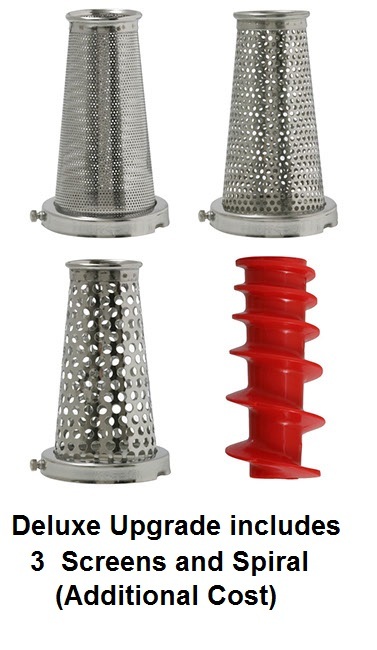 I love the Victorio strainer--this year I also bought the electric motor. Loved the ease of making 90 quarts of applesauce. We saved a ton of work making jam. A great product that works as advertised. I really like my strainer and have had it for about 20 years, however, friends and my parents have found while the strainer works beautifully it leaks A LOT! We all have to put down newspapers on the floor and the counter to catch juices that leak through the connection points. I've tried replacing the bands, clamping down the clamp and screws but we always have a huge mess to clean up after I process tomatoes or grapes. I was on this site today to see if a newer model may not leak so much. Any opinions? Veteran User - Rave Review! I have had my Victorio Strainer for 15 years and would not live without it! I have used mostly for tomatoes and black raspberries. With tomatoes I make juice or sauce or ketchup with standard strainer and spiral. With black raspberries I use the grape spiral and berry strainer and am able to run the pulp thru about five times to get every last drop of juice out of those berries - I do have to scrape the strainer with a knife after each run through (just what I can reach without removing the tray). It makes the processing so much easier and faster. Is it a mess to clean-up -- yes. but not nearly the mess of any other methods which are not nearly so efficient. I just finished the black raspberry season with enough juice to make FOURTEEN batches of jelly! I also let me neighbor borrow my strainer so it does double duty - it is sturdy and has stood the test of time. I have only had to replace the gasket, the spring mechanism and the clear plastic pulp guide. Also, the rubber patches on clamp section have hardened so I just use a pice of bicycle tire tube between counter and clamp for stability. I will add that I tried to do grapes a few different times in the past and each time I swear I will never try it again, just not worth the mess to me. I love my Victorio and have used it so much over the last 45 years that I wore it out. This is my second one now. I tell all my fellow gardeners/preservers to buy only the Victorio. All 4 of them have! I purchased and received the Victorio Food Strainer Sauce Maker in the time frame indicated. I used it to process pumpkin and it performed exactly as stated in the product information. I did purchase the electric motor to go along with it, and it made processing the pumpkin a breeze. I highly recommend this product. Adding the motor attachment makes the work even easier for making Applesauce!! It works good and saves me time. It meets my expectations! A lot of work cranking and juice leaks out of handle and a lot of residue & sediment comes out with juice when doing grapes and I have the grape spiral. It was a little difficult to attach the cutter, but once on, it worked very well. The strainer was a bit hard to scrape and then clean, Overall, I like this product, and it made short work of the mound of apples I had. Excellent service. Item performs better than expected. Extra attachments well worth the money. The house on the corner had apples on the ground. I picked one up and took it home and ate a slice to see if it tasted good. Next morning the apple hadn't turned brown where it was sliced. And it tasted good. After asking for permission from the owner who didn't want them I picked up all the apples on the ground. Some of them were rotten or sliced by the lawnmower. I put them in a trash sack inside a flat box. The ones that were good or mostly good went in two other boxes each lined with a plastic bag. I trimmed bad spots and pulled stems, cutting apples in quarters. Then I set up the strainer which I washed with a brush and soapy water the night before. Assembly was obvious using the exploded parts diagram. Any questions were answered in the brochure. I really liked the padded clamp and the large extension so it could fit even a wide table top without damage. So far we have turned two or three bushels of marginal apples into beautiful apple sauce. The quartered apples are placed in a large pot which has a steamer with holes that fits inside. My steaming water turned into apple juice after quite a few batches. I steam the apples for 20 minutes. They are soft enough to be pushed by the mechanism through the screen with all the skin, seeds and other core material leaving through the clear extender cup. When I was growing up the extender was not available or ours was lost, because this is much better than I remember. The scraps come out dry which means all the good stuff has been captured in the sauce. The pusher I remember as a boy was wood. The red plastic is not as sturdy. When I washed it the hole at the top let water get in so I had to swing it upside down to clear the water out. Now someone has either pushed too hard, or the plastic is not very sturdy because it has started to split at the bottom. It may be designed softer so it does not damage the turning spiral. Everything fits securely and seems to be working well. It is actually quite fun to put steamed apples in the top and to grind out separated core materials and applesauce. Yum. I owned one of these and bought one for a newlywed. It is so easy to use and makes canning tomato sauce a snap. I used to blanch and remove the skins that way and it took forever and was messy. This makes it so easy to process all the tomatoes fresh from my garden. No more food loss now! Overall a useful tool. I had a previous apple sauce maker. This one works just as well. Outstanding, and the design improvements are perfect. I am getting older and lazier so I was thinking about giving up on tomato sauce making but then I saw this new design and the motor makes it a breeze. I highly recommend it to everyone. My neighbors are really jealous! Delivery was prompt and I am very happy! I would have said "Excellent", but for the problem of attaching the motor to the unit. After several minutes and lots of attempts (and some serious anxiety) to get the motor attached (without major wobbling and falling off), I finally gave up and used the hand crank to process tomatoes for sauce. Later I had help getting the motor attached and finally (again after several attempts and some frustration) got the motor attached, however, it still wobbles a bit when turned on to do berries for jam. Is this normal? I really like the strainer, but there must be a better way to attach the motor without the frustration and wobbling. This strainer is hard to put together and the handle would not turn. I used model 210 for over 25 years and opted for replacement parts instead of this cheaply made newer model. We would not be without this for doing applesauce or canning tomato products. It makes doing them a breeze. I purchased the Victorio Strainer to replace my prior one, which had been lost during a move. This model works just as well as the old one, and quickly turned my tomatoes in nice, clean juice. I also purchased the motor, which I did not have before, and I highly recommend it. It runs quietly and smoothly, and at a good pace, saving me a huge amount of cranking. My 5 year old daughter could feed the tomatoes into the hopper as fast as I could cut them up, and we were done in no time. Wonderful time saving product. Prompt delivery and well packaged. Put it to work immediately and it has performed admirably. Sorry, I didn\'t get one long ago. Have not used yet. But arrived quickly. Love, love, love my new victorio sauce maker. A friend had told me how much she enjoyed hers so I wanted to try the same. It is absolutely wonderful. My 3 and 4 year old grandchildren loved helping put tomatoes in to make pizza sauce. I am anxious for grapes to come in season to try the new grape attachment. This is th best sauce maker I have ever used!!! I strongly recommend it. It's a 10 out of 10 rating. LOVE, LOVE, LOVE my Victorio! since i received it i have processed 150lbs of tomatoes...fast and easy..My 5 year old grandson had no problem using it!! Wished I had found this years ago....The customer service is awesome...so thankful for the gentleman that helped me with my crazy address..(google chrome had prefilled my address...I did not realize it had listed my work instead of my name with my address...needless to say it was returned to sender. The customer service gentlemen returned my call with in minutes and solved my problem.....thanks for a great product and great service! This is the coolest tool in my canning supplies! I researched food strainers for a couple of weeks and decided to purchase the Victorio. I like the size of the hopper and the sturdiness of stand. 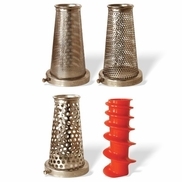 I am excited to try the different size strainers, too. I really wanted to the KitchenAide attachment but the hopper is way to small for the amount of apple sauce I make every year. I was surprise to receive one day after I placed the order. Thank you for carrying the tools for the serious home canners. I used one that was 50 years old, and it was all metal or aluminum with a wooden handle plunger. This product has accessories that are made of plastic and the plunger is empty plastic. While it did what it was intended to do, the connection between the screen and the main part even with the gasket was a pain to connect and leaked when making applesauce. I would not recommend this product to anyone.. The strainer arrived promptly, on time, per the tracking code provided in the shipping notification email. It arrived with the second item ordered (the brush). My daughter has already used it to make applesauce for canning and is very happy with it. The mounting clamp on the Victorio Juicer is not adequate for mounting on a modern kitchen rounded counter top. It slips in use, so I decided to modify. A strong clamp was purchased off the internet and modified. The original clamp on the juicer was cut off and two 1/4 inch holes drilled for mounting. On the purchased mounting bracket two corresponding holes were tapped for taking 1/4 inch threaded bolt. This can be done with a hand drill, but is decidedly easier if taken to a machine shop. Fortunately I had the necessary bit and a tap.The modified mounting system is rock solid.